We want to apply statistical procedures to the swarm of points in Boltzmann's space. To do this we first divide that space in -dimensional cells of size , labelling them by ( ). There is a characteristic energy pertaining to each such cell. For instance, in the ideal gas case this energy is simply , where is the velocity of the particles in cell . Now we distribute the particles over the cells, such that particles are allotted to cell no. . In a closed system with total energy the population numbers must fulfill the condition . The other condition is, of course, the conservation of the number of particles, . Apart from these two requirements the allottment of particles to cells is completely random. We may understand this prescription as the rule of a game of fortune, and with the aid of a computer we may actually play that game! Instead of playing the game we may calculate its outcome by probability theory. For good statistics we require that . A specific -tuple of population numbers will here be called a partitioning. (If you prefer to follow the literature, you may refer to it as a distribution.) Each partitioning may be performed in many different ways, since the labels of the particles may be permutated without changing the population numbers in the cells. This means that many specific allottments pertain to a single partitioning. Assuming that the allotments are elementary events of equal probability, we simply count the number of possible allottments to calculate the probability of the respective partitioning. (In combinatorics this is called permutations of elements - i. e. cell numbers - with repetition). 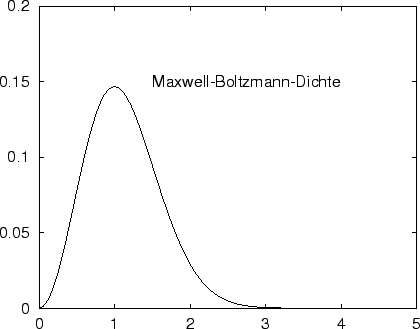 This density in velocity space is commonly called Maxwell-Boltzmann distribution density. The same name is also used for a slightly different object, namely the distribution density of the modulus of the particle velocity (the ``speed'') which may easily be derived as (see equ. 1.66). So we have determined the population numbers of the cells in space by maximizing the number of possible allottments. It is possible to demonstrate that the partitioning we have found is not just the most probable but by far the most probable one. In other words, any noticeable deviation from this distribution of particle velocities is extremely improbable (see above: multinomial distribution.) This makes for the great practical importance of the MB distribution: it is simply the distribution of velocities in a many particle system which we may assume to hold, neglecting all other possible but improbable distributions. EXAMPLE: The mass of an molecule is ; at room temperature (appr. ) we have ; therefore the most probable speed of such a molecule under equilibrium conditions is .